With this colorful model, the five planets and Moon can be shown just as Ptolemy described them in his famous handbook, The Almagest, which accurately describes all the naked eye phenomena of our solar system. When compared with the Copernican System, this model lets students gain a clear and correct understanding about the motions of heavenly bodies. 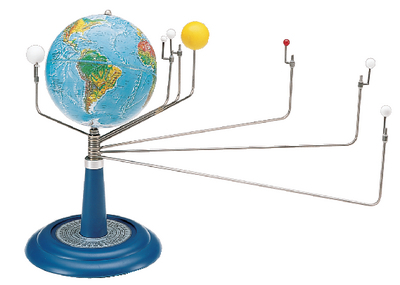 The model is ruggedly constructed of colorful materials with removable, stainless steel arms showing the apparent orbits of the Moon, five planets, and asteroid belt around a 15cm diameter Earth globe.